Lumbar sympathetic blocks are injections given to relieve pain associated with lumbar nerve clusters. A network of nerves known as the sympathetic chain, roughly spanning the spine and running parallel to it, is an important part of the human nervous system. These nerves have roots within the spine and radiate outward to influence a range of functions in the body. A cluster, also called a ganglion, comprises a nexus of nerve endings. A chain of these clusters—running from the upper body to the lower—control sensation and movement. The lumbar sympathetic chain controls sensation and blood flow to the extremities. When nerves in these clusters are damaged or irritated, the sensory and blood pressure-control signals to the legs, feet, or pelvis may become abnormal and can result in pain. This is not easily or reliably treated by oral medications. Direct injections of pain-relieving drugs are a more effective and beneficial treatment option. 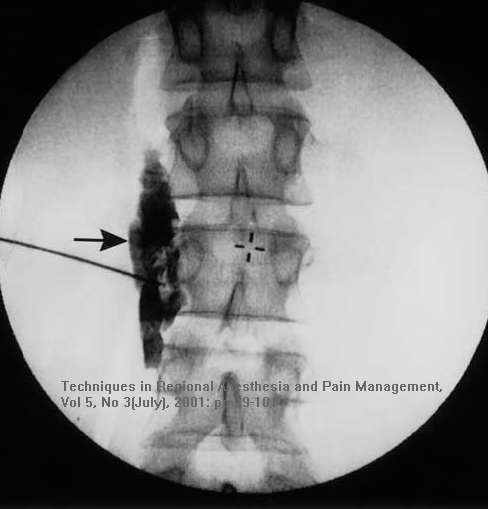 This involves the injection of a local anesthetic into the affected cluster of the lumbar sympathetic chain to “block” pain sensations that involve or originate from the sympathetic nervous system. Lumbar sympathetic blocks are effective in relieving some chronic pain conditions. Those with pain in the legs or pelvis, that is resistant to oral medications, have experienced pain relief after a lumbar sympathetic block. First, a local skin anesthetic is administered to numb the area that is to be injected. Then another needle is inserted near the nerves that are the source of pain. The location of these nerves is pinpointed with techniques such as magnetic resonance imaging (MRI) and fluoroscopy to ensure accurate needle placement. A local anesthetic (e.g. 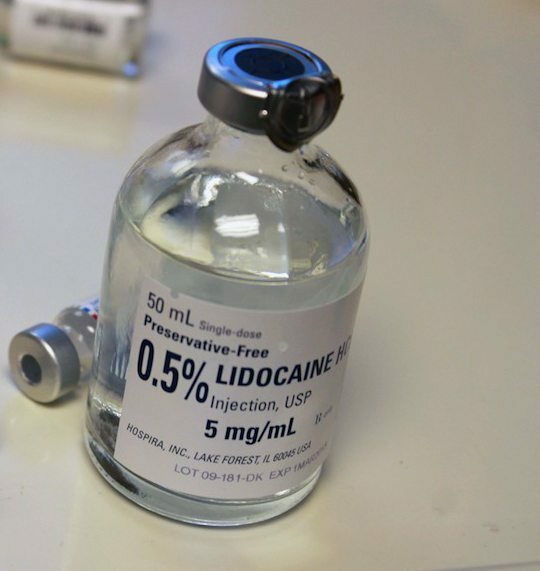 lidocaine) and a corticosteroid are injected into the space where the sympathetic nerve clusters are located. The steroid reduces the inflammation associated with chronic pain conditions, and the anesthetic stops the pain emanating from the nerves in the cluster. A physician will monitor the patient after the procedure to assess the pain relief achieved from the block and to ensure there are no adverse side effects. Diagnostic lumbar sympathetic blocks are used to evaluate the source of pain. Administration of a lumbar sympathetic block when analyzing back or neck pain, is useful in determining whether or not the pain is originating from the sympathetic nerves. It also has the advantage of being a minimally invasive treatment that has afforded pain relief for many patients with chronic pain. Lumbar sympathetic blocks allow people to resume their normal daily activities in a way that oral medications do not. Sympathetic lumbar blocks have a low level of risk. Complications include bleeding, infection, nerve damage, and pharmacological complications arising from the drugs delivered by the injections. Steroids included in sympathetic blocks can cause an increased risk of arthritis and osteoporosis (brittle bones). They can also result in immune system depression and weight gain. The local anesthetics injected may cause reduced nerve function and interact with other medications taken by the patient to produce adverse effects. In some cases, temporary but severe reactions to local anesthetics, such as chest pain and respiratory problems, can occur. These are known as neurological deficits. They are not usually in need of treatment or last long, however. Lumbar sympathetic blocks can produce other strange side-effects in rare cases, such as priapism, which is an involuntary rush of blood to the pelvic region—a problem primarily experienced by men. Occasionally, a headache, drooping eyelids, and the sensation of a blocked nose can occur as a result of lumbar injections. Lumbar sympathetic blocks are administered to treat lower back and leg pain that result from affected lumbar nerve clusters. They can also treat pain in the legs or pelvis resulting from cancer or cancer treatment. Patients with complex regional pain syndrome that affects their legs can also benefit from lumbar sympathetic blocks. This condition causes chronic pain that comes from an undetermined source or has more than one separate cause. 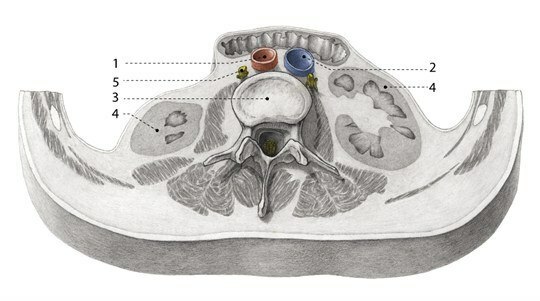 Lumbar sympathetic blocks are also used to diagnose a source of pain, i.e. to trace it to a sympathetic nerve or cluster. The lumbar sympathetic chain controls a range of bodily functions and nervous signaling, including sensory signals. Damage or malfunction in these nerve clusters can be a source of pain and irritation in the legs or lower back. Lumbar sympathetic blocks are injections into nerve clusters involved in signaling pain. Lumbar sympathetic blocks treat a variety of conditions. The risks of this procedure are mainly bleeding, drug interactions or adverse effects, and nerve damage. They are, however, a safe and effective alternative to surgery and other more invasive procedures. Fritz J, Sequeiros RB, Carrino JA. Magnetic resonance imaging-guided spine injections. Topics in magnetic resonance imaging : TMRI. 2011;22(4):143-151. Gulati A, Khelemsky Y, Loh J, Puttanniah V, Malhotra V, Cubert K. The use of lumbar sympathetic blockade at L4 for management of malignancy-related bladder spasms. Pain physician. 2011;14(3):305-310. Krumova EK, Gussone C, Regeniter S, Westermann A, Zenz M, Maier C. Are sympathetic blocks useful for diagnostic purposes? Regional anesthesia and pain medicine. 2011;36(6):560-567. Bottger E, Diehlmann K. [Selected interventional methods for the treatment of chronic pain: Part 1: peripheral nerve block and sympathetic block]. Der Anaesthesist. 2011;60(5):479-491;quiz 492. Balthasar A, Desjardins AE, van der Voort M, et al. Optical detection of vascular penetration during nerve blocks: an in vivo human study. Regional anesthesia and pain medicine. 2012;37(1):3-7. Rigaud J, Delavierre D, Sibert L, Labat JJ. [Sympathetic nerve block in the management of chronic pelvic and perineal pain]. Progres en urologie : journal de l’Association francaise d’urologie et de la Societe francaise d’urologie. 2010;20(12):1124-1131. Hong JH, Oh MJ. 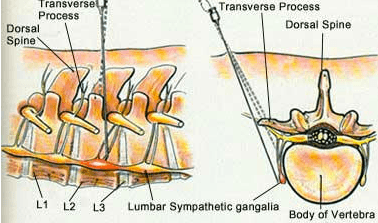 Comparison of Multilevel with Single Level Injection during Lumbar Sympathetic Ganglion Block: Efficacy of Sympatholysis and Incidence of Psoas Muscle Injection. The Korean journal of pain. 2010;23(2):131-136.